The Storyline clipboard allows you to cut, copy, paste, and duplicate content in your course. You can also use a handy clipboard feature called the Format Painter to quickly apply attributes from one object to another. In this tutorial we’ll get acquainted with Storyline’s clipboard tools so you can speed your development time. When you’re working with slide content, either on your course slides (in Normal View) or on your slide masters (in Slide Master View or Feedback Master View), there are several things you can do with the clipboard. To select an entire slide, click the slide thumbnail in the left column of the editing window. 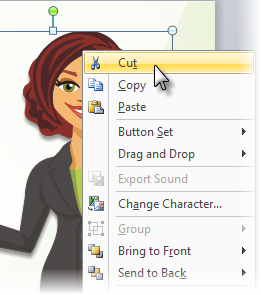 If you want to cut or copy multiple slides, you can use Shift+Click to select multiple consecutive slides, or use Ctrl+Click to select multiple nonconsecutive slides. To duplicate the items you've selected, do any of the following. Press Ctrl+D on your keyboard. 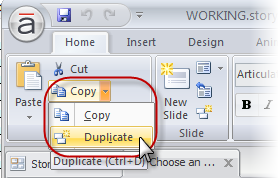 Or, on the Home tab, click the small arrow next to the Copy option and choose Duplicate . Or, right-click the item and choose Duplicate. To cut the selected item(s), do any of the following. When you cut an item, it'll disappear from view, but Storyline will keep it on the clipboard for pasting until you cut or copy something else. Press Ctrl+X on your keyboard. Or, on the Home tab, click the Cut option. To copy selected items to the Storyline clipboard, do any of the following. 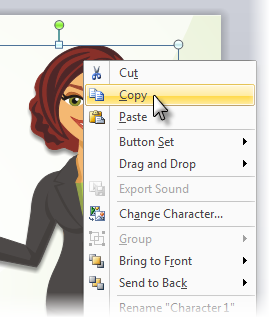 When you copy an item, Storyline keeps it on the clipboard for pasting until you cut or copy something else. Press Ctrl+C on your keyboard. Or, on the Home tab, click the Copy option. Or, right-click the item and choose Copy. Press Ctrl+V on your keyboard. Or, right-click on your slide and choose Paste. Or, click the Paste option on the ribbon. If an object you’re pasting has some formatting related to a design theme (such as a theme color), it’ll pick up the design theme from the destination where you paste it. If you want it to retain its original formatting instead, you can click the arrow at the bottom of the Paste option and choose Keep Source Formatting. In Normal View, Slide Master View, and Feedback Master View, the clipboard function includes a handy tool called the Format Painter. It allows you to quickly copy formatting from one object to another. This includes text formatting, as well as any attributes you've applied to images, shapes, captions, and characters. And if you've assigned any states or triggers to the item you're copying from, the Format Painter copies those too. 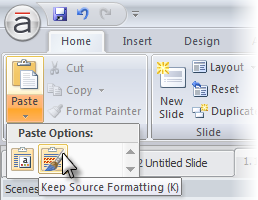 On any slide or slide master, select the item whose formatting you want to copy. Click the Format Painter (paintbrush) icon. Your cursor will change into an arrow with a paintbrush to let you know that the Format Painter is active. Now click the item to which you want to apply the copied formatting. The formatting gets copied and the Format Painter automatically turns off. Want to reapply formatting to multiple items? You can double-click the Format Painter, which keeps it active until you turn it off. This way, you can continue applying the same formatting to as many items as you like. To turn the Format Painter back off again, just click the paintbrush icon on the ribbon or press Esc on your keyboard. To select an individual slide, click on the slide title or the slide thumbnail. You can select multiple slides by using Shift+Click to select multiple consecutive slides, or Ctrl+Click to select multiple nonconsecutive slides. When you select a slide, it’ll have a yellow outline. To select an entire scene, click the scene title or the gray bounding area of the scene. When you select a scene, it’ll have a yellow outline. To duplicate your selection, do either of the following. 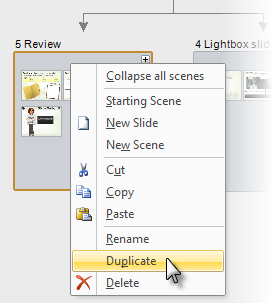 Or, right-click the selection and choose Duplicate. Click the Cut button on the Home tab. Or, right-click the selected item and choose Cut. Click the Copy button on the Home tab. Or, right-click the selected item and choose Copy. Click the Paste button on the Home tab. Or, press Ctrl+V on your keyboard. Or, right-click in your Story View workspace and choose Paste.